Taking a break after finishing the complete corpus of Anglo-Saxon poetry was fun, but I have found that I miss reading and re-reading bits of Old English every morning and then staring into the monitor as I try to edit the sound files. So I’m moving on to Anglo-Saxon prose. I am not promising to do the entire corpus this time. The poetic corpus is about 30,000 lines and it took two years. The prose corpus is an order of magnitude larger, and I’m not at this stage prepared to make a 20-year commitment. But we’ll give prose a try and see what sounds good. Originally I had thought to start with the Anglo-Saxon Chronicle, but there are too many Roman numerals in there right now (not that I can’t read Roman numerals, but I not particularly good at converting them into Old English numbers on the fly), so I’ve decided to go with Wulfstan’s homilies. I’m using Dorothy Bethurum’s edition and working through in chronological order. As was the case with the poetry, I’ll try to post every weekday with the equivalent of 100 lines of text. Anglo-Saxon Aloud wins an award ! This award is incredibly gratifying, because it comes from the people who know best (the medievalist blogging community), and I really appreciate the award and Larry’s putting together the whole thing. Of course it is a little ironic that I got the award just as I got too much of a cold to effectively finish up the poetry. The entire ASPR is recorded and posted, but there are a few other short poems (well, except Instructions for Christians, which is a beast). As soon as my voice no longer sounds like I have smallish bees up my nose, I’ll finish that up and then try some prose. With the last post, the entire Anglo-Saxon Poetic Records is now available through this site. But Anglo-Saxon Aloud is not quite finished with Anglo-Saxon poetry. Over the next two or three weeks I will be posting spoken versions of Psalms 51-68, which I originally recorded as sung versions. I will not be removing the old sung versions, but will be adding a [sung] tag to them. When those Psalms are posted, the entire ASPR will be available in spoken form (I may return to the sung Psalms one day when I have better internalized the music of Psalmody). I hope to have all of these (most of which are extremely short) recorded, edited and posted, along with Psalms 51-68, before February 21, which will be the two-year anniversary of this site. Then, after the poetry is done, I may take a break before moving on to posting some Anglo-Saxon prose. I may begin with the “Anglo-Saxon Chronicle Reading of the Day” or first may record some homilies or perhaps the Sermo Lupi: I haven’t decided yet. Anglo-Saxon Aloud will be on temporary hiatus until November 21. Please enjoy the poems in the archives. Because I don’t think “The Shire” has internet access, I will not be able to post on Thursday or Friday. You can get your fix of Anglo-Saxon Aloud from the archives, or buy a copy of Anglo-Saxon: Greatest Hits here. 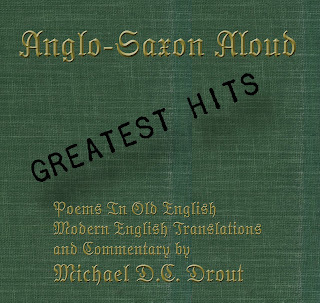 Anglo-Saxon Aloud Greatest Hits is a 2-CD set that includes ten poems in Old English, their Modern English translations, and commentaries on each of them as well as an introductory lecture. The poems included are: Cædmon’s Hymn, The Battle of Brunanburh, The Wanderer, The Ruin, The Wife’s Lament, Wulf and Eadwacer, Deor, The Fortunes of Men, Riddle 47 (Book-Moth) and The Dream of the Rood. I will have copies with me at A Long-Expected Party in Kentucky next weekend. For listeners who don’t use PayPal or who are overseas, email me at mdrout@wheatoncollege.edu and we can make arrangements. You can also send me land mail at Prof. M. Drout, Wheaton College, 26 E. Main Street, Norton, MA 02766, USA. Thanks to all the listeners and readers who have given me so much encouragement. 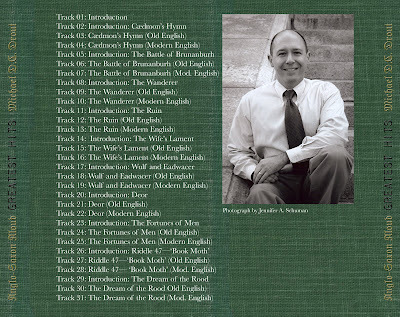 And if people like Anglo-Saxon Aloud Greatest Hits, I can maybe someday put together Anglo-Saxon Aloud: Unplugged. The temporary hiatus of Anglo-Saxon Aloud, caused by various events, should end on Wednesday, June 11. Anglo-Saxon Aloud Will Return Monday, with more singing. See many of younz at Kalamazoo… Friday, 11:00 in Valley III near registration. I am working on the sung versions of the Psalms of the Paris Psalter and hope to start posting them on Thursday. That will wrap up the ASPR in approximately five weeks. Anglo-Saxon Aloud will be on hiatus for a couple of days until I get over a little case of laryngitis.